Graphic designer Aaron Draplin takes a look back on his career so far in this detailed and heartfelt book. 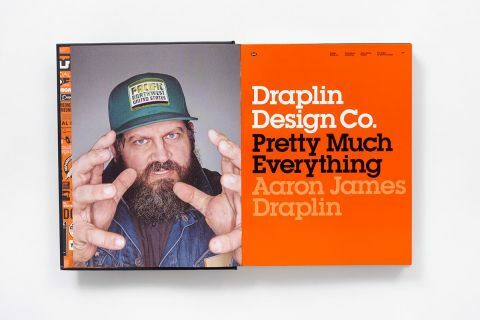 With a wealth of work and a funny personal touch, Pretty Much Everything is a valuable and informative insight into the life of designer Aaron Draplin. Part showcase, part autobiography, designer Aaron James Draplin's book Pretty Much Everything certainly lives up to its name. This mid-career retrospective is stuffed with countless examples of his influential work, ranging from snowboard graphics to logo designs, and insights into Draplin's unruly career path. Delivered with his straight talking yet heartfelt voice, this is the book equivalent of Draplin putting his shoulder round the reader and guiding them through the different stages of his life. Inside you'll find details about him growing up in Detroit, moving somewhere wild, and forging his career as a designer. These stories are nestled amongst a comprehensive collection of images that include childhood toys, notebook drawings, and family photos, as well as professional projects such as the Field Notes books and the 'Things We Love' state posters. As designer autobiographies go, this is as intimate as it gets. Appropriately enough, the whole book itself is well designed and beautiful to look at. While the sheer amount of images might appear overwhelming at first, once you've got used to the flavour of Pretty Much Everything you'll be hungry for more. Not only is Pretty Much Everything a unique chance to look behind the scenes into how a successful graphic designer works (breathe a sigh of relief if you like hoarding stuff, it seems you're not alone), it's also packed with valuable lessons learnt from a variety of commissions and clients.